Make the Starbucks Caramel Macchiato at home, it is an easy espresso drink to prepare. I love grabbing a coffee from Starbucks when I am out running errands or need a quick pick me up. It’s a luxury to be able to stop at my favorite coffee shop. I’m a creature of habit when it comes to my favorite drinks. I try to change it up a bit but I always come back to the caramel macchiato. Did you know it is easy to make your own fancy coffee house drink at home. When you make your own homemade caramel macchiato you never have to worry about the price of a Starbucks Caramel Macchiato. If you like you can buy the syrups and coffee at Starbucks so you are starting with the same ingredients. The caramel macchiato has been a mainstay at Starbucks since they opened their first coffee shop in Seattle Washington in 1971. It has to be the caramel drizzled down the cup or on top of the whipped cream in the signature crosshatched Starbucks pattern that makes it just so delicious. It is one drink that customers always request and is considered one of their most popular drinks. Macchiato literally means “stained milk” and you can see the beautiful color change while the espresso and steamed milk mixes together. It is considered a layered drink, but I like to mix all the flavors together. No Espresso? No Problem. If you don’t have a fancy espresso maker at home, you can simply brew coffee that is very strong. Or you may want to pick up one of these coffee pots at home. Italian’s make their espresso with one of these. They make amazing espresso for a great price. Do you enjoy Starbucks Copycat Recipes? Be sure to check out my other great Starbucks menu item copycat recipes here. Make your own Starbucks Caramel Macchiato at home. 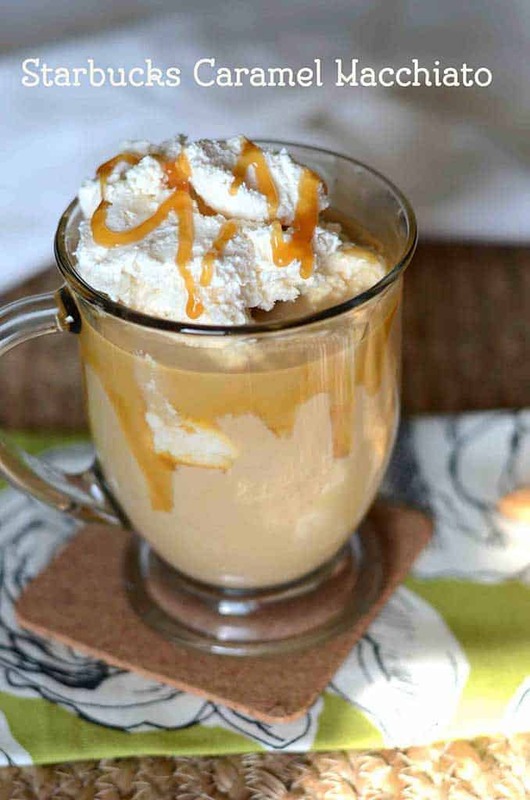 Start by adding your caramel syrup to the bottom of a coffee mug. Drizzle your caramel sauce around the rim of the cup. Pour the hot espresso over the syrup and stir together. Add the milk and vanilla syrup and give another quick stir. Top with whipped cream (homemade whipped cream is my favorite!) and another quick drizzle of caramel sauce. And there you go! That’s all you need to make this coffee house caramel macchiato. 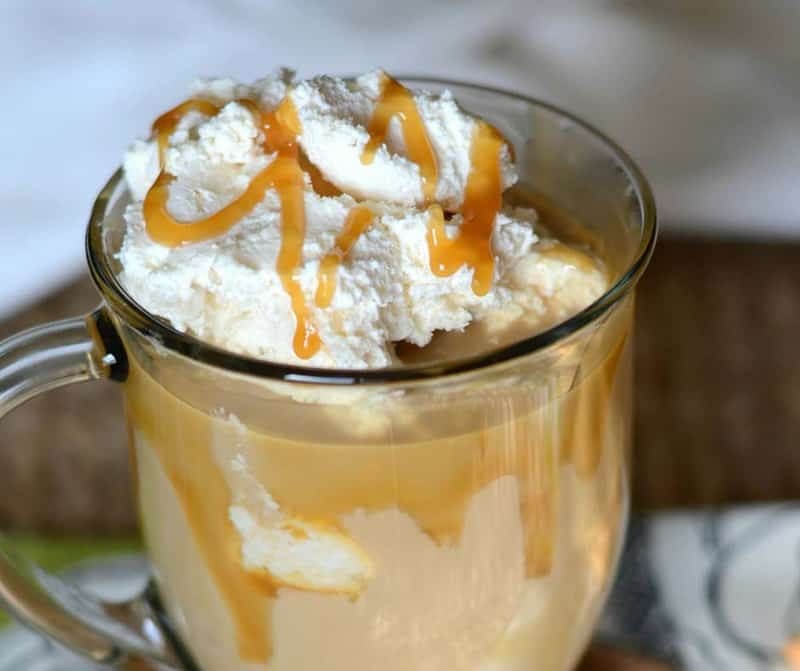 The great thing about this recipe is once you buy the caramel sauce and vanilla syrup you can make dozens of this coffee at home. So stock up on those and make this delicious drink! Polly we need both in here. This makes it taste so good. Looking for a recipe for Starbucks lemon pound cake. It is delicious. Does anyone have a copycat recipe for Starbucks lemon pound cake? It is delicious. There is is a really good recipe for Better Than Starbucks Lemon Poundcake on the Averiecooks website. I am not a coffe-Holocene! I like the cold Green Tea Frappecino with soy milk! Refreshing, non-caffeine & delicious! I have never tried one of those. It sounds delicious. I work at Dunkin Donuts, so I make all of the same coffee drinks that Starbucks make. I really find it fascinating. So anyway when I go to Starbucks my favorite drink is tall black coffee no sugar. Then I’m in heaven. And that’s the truth. I wished I could drink my coffee black. I feel it always needs cream. Would love to find recipe for Cranberry Bliss bars. One of the Starbucks treats I look forward to every Christmas. Mocha with skim and whipped and a blueberry scone. I love a good mocha! I used to think old men who drank their coffee black were strange. Now I’ve become one of them. Before I hit 50, I would have loved drinks like this. Since then, I’ve decided they are too sweet, not necessarily for everyone, but for me. I used to gorge myself on candy and Pepsi and desserts. I don’t know why I stopped. A month ago, they had 5 for $5 on two liter Pepsi products. I used to go through Pepsi like crazy, but I drank half of one bottle within a week, and the other four are still unopened. About the only candy I consume are Dove dark chocolate bites, and the label says 5 pieces is a serving, but I only want 2 or 3. I bought myself a machine so I could make Hawaiian Shave Ice, and I keep thinking that I’m going to experiment around with brewing concentrated coffee, so I cam make myself black coffee snow cones. I suspect if I just used regular strong coffee, cold, it’d taste too weak. Or maybe I could make a black coffee granita. Sure wish I could enjoy the taste of this recipe, but that’d be a sin to invest the time and money to make your recipe, and abandon it after one taste. Steve, don’t mean to be nasty but what is your point? Chai always reminds me of fall. What is your favorite treat at Starbucks? Just walking into Starbucks is a treat. I feel like I have come home. They are so welcoming. I frequent Barnes and Noble Starbucks after shopping and am able to have a hot or cold drink and relax with a book or magazine, catch up on email, and just relax till the “guys” are ready to pick me up and head home. Love all coffee and most teas so it is hard to pick a favorite. I don’t know why I don’t grab a coffee at Barnes and Noble more often. There is a nice one near my house. That sounds like a good way to cap off shopping.